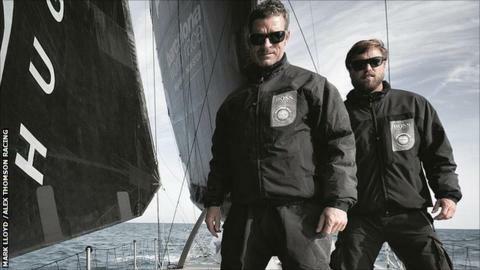 British sailor Alex Thomson says he is "gutted" after a rigging failure ended his hopes in the Barcelona World Race. Thomson and fellow skipper Pepe Ribes were leading the rest of the field but their mast fell overboard in the South Atlantic Ocean, off the Brazil coast. "It is one of those things, it shouldn't happen," Thomson told BBC Sport. "It is really disappointing." Thomson, who finished second in the event in 2007, and Ribes are now heading for land at Salvador in Brazil. The 40-year-old said that would take about three days and the boat will then be transported back to Britain so a new mast can be built. The pair set off on New Year's Eve and the race was due to last three months, with the boats sailing about 23,000 nautical miles non-stop around the world from west to east. "We are both gutted, but on the bright side we are building a new boat in Southampton and we will pick ourselves up and try to win the Vendee Globe," he added. It was Thomson's third time in the race - as well as the second-placed finish eight years ago, he failed to get off the start line in 2011 because of appendicitis.